I’ve always had some form of exposure to homelessness. Seemingly everywhere I’ve been there have been homeless people, some places more than others, but going all the way back to childhood I can recall specific homeless people. There was “Bill” in my hometown, a Vietnam vet who kept to himself, supposedly had a trust fund and family support, but had largely cut himself off from society (and it remains unclear how much his family supported him beyond providing access to money, which he never sought, to my knowledge). He was gracious and quiet, humble and unassuming. He died somewhat recently, I heard, and I never had any real interactions with him other than seeing him. In college there was “Spare Anything” (named such because that was his catchphrase) who would wait outside the bars and ask for change, always heckled and dehumanized for one reason or another (drunk, affluent college kids are the worst). He was gruff and discourteous, but I’m not sure if “we” made him like that, or if that’s why we responded to him the way we did. There was “Vodka Steve” who wandered the campus during the day, pint of vodka in hand, bothering no one, and largely talking only to himself. He frequented the pizza place I worked at, typically to get a meal in exchange for picking up trash in the parking lot or cleaning the bathroom. The owner seemed to take a liking to him; maybe one of the few folks who treated Steve like a human. In all the places I bounced around after college, homeless folks were abound. Some were called “trustafarians” because they were believed to be trust fund kids who “chose” to be homeless. In some instances these privileged few took advantage of the “system”: it was documented in a few places how some panhandled by day, making upwards of $100 on false pretenses (and the guilty consciences of the seemingly well-to-do), only to drive off in their high dollar SUVs to their apartments in the city of have’s to get ready for the night’s social events. But they weren’t all milking the system; most were genuine transients, drawn to this city or that because of the wealth of resources for those experiencing homelessness. I recall a few interactions with some of them, not all positive, not all that I’m proud of. There has to be a better way to fix this societal problem than simply looking the other way and sweeping them under the rug. One incident I’m not particularly proud of was when a homeless guy was arrested at my place of employment (this happened frequently) and I was to detain him until the police arrived. Well, it escalated for one reason or another to the point where I punched him – he was incapable of fighting back or defending himself. I was applauded for “standing my ground” and “defending the business” from the “dregs of society.” I was really simply taking advantage of someone who had likely only been taken advantage of their whole life… Another time, after the bars closed and I had a good buzz going on, I picked up a guy who was panhandling, must’ve been 1-2am. I asked him if he was hungry, he was, so he got in my car and we drove to Wendy’s. I bought him a bunch of food and dropped him back of at his spot. Another time I was back in my hometown around the holidays and a guy was sleeping in an alley in the rain, covered up as best he could to protect himself from the elements. It didn’t matter; he was still getting soaked. I walked over to him and gave him $5 – it wasn’t much, and the truth of the matter is I could’ve afforded more. More recently I’ve been giving another guy I see fairly often $2-5 once a week or so. I’m always in my car at that spot, the light’s always about to change, but I feel like there’s somewhat of a relationship there. But I’m forced to wonder: am I doing these acts to make up for the times when I turned a blind eye (or worse)? Am I doing these things to simply make me feel good? Or do I really care about the societal problem that preceded each one of these individual’s situations? Several years ago I was at an MLB game with some friends, and one of the guys selling beers just looked like he had lived an awfully hard life. In some ways he resembled a buddy I was with, and that fact wasn’t lost on my friend. My friend said, “I’m one bad decision away from being that guy.” We all are. A little luck, and a lot of social love and support has kept me out of the gutter. But lord knows I’ve made some decisions that could’ve landed me there time and time again. At least this guy had a job. Many don’t. Where I live now, homelessness is a big issue (it’s a big issue everywhere it exists). But as with any issue, it has folks on either side of the matter, and unfortunately a lot of it comes down to people’s comfort. There has been much discussion as to how to clean up downtown (i.e., rid it of the homeless folks) to stimulate business, encourage tourism, and make people feel comfortable when they’re out spending money, drinking, shopping and eating. Real concerns, no doubt, but clearly the prizing of the bottom line over the individuals who don’t have two dimes to rub together. There has been a move to criminalize some aspects of homelessness – which is really just poverty at its last stop. These include keeping people from panhandling in (publically owned) parking garages; blocking sidewalks; and loitering charges to name a few. There were even attempts to police language and subvert attempts at asking people for money – things that are protected by the First Amendment. As a person with a big mouth and a big ego who likes to be heard, I look down greatly at attempts to curtail speech and expression, so my ears perked up. So ever since meeting this guy leading the charge, as well as some of the folks who are actually experiencing homelessness, I decided to help them out as much as I could. Not by giving them money more often, but by applying my thinking, abilities and networks to attend to the problems that sucked them all in and keep them homeless. I’m not sure where it’ll lead, but I know I’ll learn a lot. 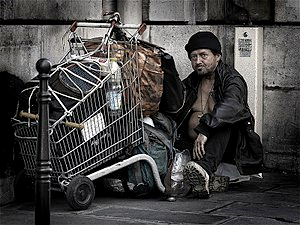 Who knows, maybe I can compensate for those past actions, words and thoughts that I had about the homeless; when I only saw them as impediments to my life, or something less than people. Maybe I can see them now as equals who just need a little help.